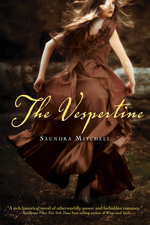 Today, as Steampunkapalooza 2011 continues, I’d like to welcome Saundra Mitchell, author of the young adult book The Vespertine. Saundra Mitchell has been a phone psychic, a car salesperson, a denture-deliverer and a layout waxer. She’s dodged trains, endured basic training, and hitchhiked from Montana to California. She teaches herself languages, raises children, and makes paper for fun. She’s also a screenwriter for Fresh Films and the author of Shadowed Summer and The Vespertine, and the forthcoming The Springsweet. She always picks truth; dares are too easy. Let it be resolved that in 1889, it wasn’t just the upper crust who danced the night away during their rigid and formalized ball season. The American middle class did just as much fan flirting and dance-card gaming as their wealthier counterparts, but I suspect they had more fun doing it. Without vast empires to merge and old money to protect with proper matches, the middle class showed up at their balls… to dance. To flirt, and fall in love; to gossip and steal sips of brandied punch. But, since the very-well-heeled weren’t opening their private ballrooms to the masses, the masses instead attended public balls. Public balls were often held as fundraisers- they might be for a charity, or a public works project. Sometimes, to raise money for a church or synagogue. Unions also played host, as well as social clubs. And then there were plenty that were simply money-making ventures. Hotels especially enjoyed the extra revenue of hosting public balls on the holidays. Sometimes, you’d pay your admission in advance- dance cards often served double duty as the ticket. Others took cash at the door. Once inside, you’d find a string quartet or brass band in the corner providing music, a refreshment parlor and a ladies’ necessary. Unlike private affairs, public balls didn’t generally include dinner. Which means you pay your money, you get your dance card, and you get straight to flirting, straight to the intrigue, straight to the best part of ball-going season: the dancing. Who said the rich get to have all the fun? I have a copy of The Vespertine to give away to one lucky commenter. Contest ends April 11 at 11:59 pm PST, contest open internationally. So if you went to a Victorian ball, what part of it would you look forward to the most?